From ca. 1400 to 1900 the Atlantic Ocean served as a major highway, allowing people and goods to move easily between Europe, Africa, and the Americas. These interactions and exchanges transformed European, African, and American societies and led to the creation of new peoples, cultures, economies, and ideas throughout the Atlantic arena. 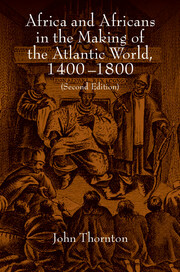 The Atlantic World provides a comprehensive and lucid history of one of the most important and impactful cross-cultural encounters in human history. Empires, economies, and trade in the Atlantic world thrived due to the European drive to expand as well as the creative ways in which the peoples living along the Atlantic’s borders adapted to that drive. This comprehensive, cohesively written textbook offers a balanced view of the activity in the Atlantic world. The 40 maps, 60 illustrations, and multiple excerpts from primary documents bring the history to life. Each chapter offers a reading list for those interested in a more in-depth look at the period. "Benjamin's is a sweeping, learned, and comprehensive history of the making and undoing of a transnational world that the peoples of Africa, Europe, and the Americas created together from roughly 1450 to 1850. Benjamin traces the rise and decline of an Iberian Atlantic followed by one dominated by the French and the British. Both systems to work, however, relied on forced labor systems and fluid but unequal sexual commerce between the races. The system came to an end with a protracted 'Age of Revolutions' that shattered empires, emancipated slaves, and brought notions of equality to the fore, but that also marginalized Africa from the global economy." -Jorge Cañizares-Esguerra. University of Texas at Austin. "One of the leading teachers and scholars in the field of Atlantic history, Benjamin (Central Michigan Univ.) has written the most comprehensive survey of the field from the Age of Exploration through the revolutions of the early 19th century and the abolition of slavery. While suitable as a course textbook for upper-division classes, Benjamin's work includes rich materials for scholars and other experts in the field. He also seeks to synthesize some of the key historiographical questions. The author interweaves primary source texts with the narrative and uses maps, tables, and illustrations to excellent effect throughout. While recognizing that Europeans were the main actors in this story, the author pays considerable attention to the interactions that created the Atlantic world. 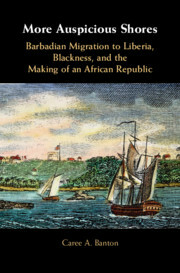 Benjamin reminds readers that the number of Africans forced to emigrate was much greater than the number of Europeans who came to the Americas. In addition, the book is particularly strong at comparing and contrasting the actions of the various European nations as well as the diversity of the Native peoples. 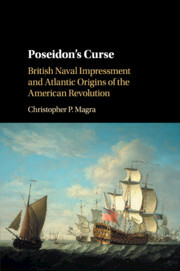 In sum, this seems likely to become the standard text in the field of Atlantic history. Summing Up: Essential. All levels/libraries." 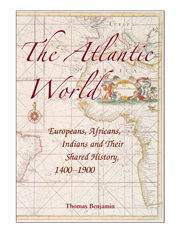 "...The Atlantic World is a good representation of the themes of the New Atlantic History, which focuses on exactly the sort of questions and interactions that Benjamin chooses. It is particularly commendable for the ease with which both Americas and Africa are included in the Atlantic World. He has been attentive to recent literature and themes. ...On the whole, then, the book is likely to be a worthwhile textbook for classes devoted to the New Atlantic History at the undergraduate level." 13. Freedom: the abolition of the Atlantic slave trade and new world slavery. Thomas Benjamin is Professor of History and a member of the Center for Transnational and Comparative History at Central Michigan University. He is editor-in-chief of the three-volume Encyclopedia of Western Colonialism Since 1450 and co-editor of The Atlantic World in the Age of Empire.